HSE Germany developed, after years of research and field trials, a unique Quenching and Self-tempering (QST) process that allowed rolling mills to produce low-cost (without use of costly alloys), high strength deformed bars which fully met the demands of civil engineers of different countries. This basic process and subsequent improvements were patented worldwide. 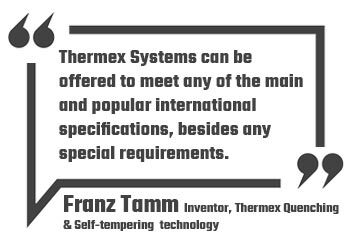 Thermex® QST Technology gained immediate global acceptance due to its simplicity and ease-of-operation. Thermex® Technology is available to rolling mills on a Licence basis. 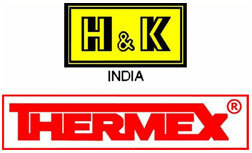 Thermex clients obtain from H&K India all critical and proprietary equipment for the Thermex QST System. This critical and proprietary equipment is specifically designed to suit individual mill parameters and the rebar properties desired by the client. Thus, start-up time is reduced to a minimal and the desired Thermex rebar properties are established on Day 1.